We’d love your help. Let us know what’s wrong with this preview of Fire Season by Philip Connors. A decade ago Philip Connors left work as an editor at the Wall Street Journal and talked his way into a job far from the streets of lower Manhattan: working as one of the last fire lookouts in America. 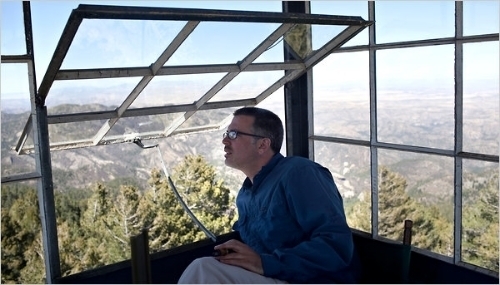 Spending nearly half the year in a 7' x 7' tower, 10,000 feet above sea level in remote New Mexico, his tasks were simple: keep watch over one of the most fire-prone forests A decade ago Philip Connors left work as an editor at the Wall Street Journal and talked his way into a job far from the streets of lower Manhattan: working as one of the last fire lookouts in America. 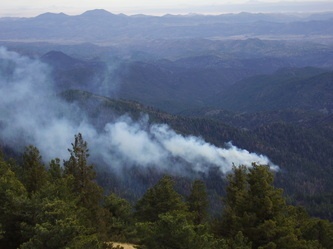 Spending nearly half the year in a 7' x 7' tower, 10,000 feet above sea level in remote New Mexico, his tasks were simple: keep watch over one of the most fire-prone forests in the country and sound the alarm at the first sign of smoke. Fire Season is Connors's remarkable reflection on work, our place in the wild, and the charms of solitude. The landscape over which he keeps watch is rugged and roadless — it was the first region in the world to be officially placed off limits to industrial machines — and it typically gets hit by lightning more than 30,000 times per year. Connors recounts his days and nights in this forbidding land, untethered from the comforts of modern life: the eerie pleasure of being alone in his glass-walled perch with only his dog Alice for company; occasional visits from smokejumpers and long-distance hikers; the strange dance of communion and wariness with bears, elk, and other wild creatures; trips to visit the hidden graves of buffalo soldiers slain during the Apache wars of the nineteenth century; and always the majesty and might of lightning storms and untamed fire. To ask other readers questions about Fire Season, please sign up. What is price of paperback? Philip Connors tried his hand at a number of jobs and did pretty well. But his true love was the outdoors, particularly the remote outdoors. So, when an opportunity presented itself for him to spend half a year in a fire tower in remotest New Mexico, he dropped his reportorial gig at the Wall Street Journal and headed southwest. He knew a fair bit about the outdoors before beginning, from his Minnesota upbringing, and learned even more on the job. He kept on learning as he kept on re-upping for Philip Connors tried his hand at a number of jobs and did pretty well. But his true love was the outdoors, particularly the remote outdoors. So, when an opportunity presented itself for him to spend half a year in a fire tower in remotest New Mexico, he dropped his reportorial gig at the Wall Street Journal and headed southwest. He knew a fair bit about the outdoors before beginning, from his Minnesota upbringing, and learned even more on the job. He kept on learning as he kept on re-upping for one more season, then another and another, amassing a lifetime’s worth of insight, contemplation and appreciation. In addition to the poetry of his language when writing of the natural world, Connors takes on policy issues as well, looking, for example, into the effect of publicly subsidized cattle grazing on public land, and on the impact of years of uninformed fire suppression-at-all-costs. Some fire is good, indeed is essential for the well-being of some environments. Smokey the Bear need not apply. Connors is a gifted story teller and peppers his narrative with welcome side-trips. For those of you who remember Mutual of Omaha’s Wild Kingdom, there is a wonderful story here about Marlon Perkins. When Connors tells of retrieving Jack Kerouac’s unpublished fire-watcher logs from the New York Public Library, it is like opening Tut’s burial site for the first time. There are enough southwest characters here to fill a good sized bar, each with an attached tale. Fire Season is a work of deep love. Connors brings a poetical sensibility to his descriptions of the natural world he experienced. To be unmoved by his nature prose is to be unmovable. He also offers information and insight into issues relevant not only to our national forest and national parks, but to our land as a whole. Hopefully, Fire Season will spark greater interest in our national forests and support for the people who take care of them. The author’s web site is definitely worth a look. A short promo vid for the book, of Connors in the field, on Youtube. 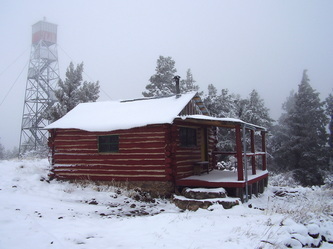 The cabin and Lookout Tower that Philip Connors used. I had a roommate in college who was a forest fire fighter. He was also a ballet dancer which may seem like two odd interests to put together, but both required strong legs. He earned enough money in the summer running all over the country digging line and operating a chainsaw to pay for his schooling during the winter. He eventually even commanded his own truck and crew. He had long, curly red hair which I often thought must have been a warren for errant sparks while out there in the smoke and roar of mother nature taking back what she had allowed to grow. I couldn’t help but think about him as I read this book. I wondered if he is still out there fighting fires or if he has settled down to some form of domestication. You see he is off the grid. Not a big surprise. I can imagine that if he does get on a computer it is only to google himself and see if his name appears. Philip Connors did what he was supposed to do. He went to college and afterwards landed a job in Manhattan working for one of the most prestige newspapers in the world...The Wall Street Journal. He grew up on a farm in Southern Minnesota. There is just something about farm kids that makes it hard to place us in a mold and hold us down long enough for us to be the same cookie as everyone else. Corporate cubicles are cages. I can picture him squirming in his seat. I can tell he suffered from the same uneasiness that I felt living in San Francisco. It took me a while to figure it out, but one day I drove down to stare at the ocean. I could feel the tension leaving my body, not because of the ocean, but because for the first time in a long time I had a horizon stretching out before me. I could see for miles. I never feel as comfortable as when I have a lot of nothing stretching out around me for miles in every direction. People are optional, but only if they are quiet. Connors ran into a friend that changed his life. She was a fire lookout and something clicked for him. The next thing he knew he had quit his job, convinced his lovely wife to move to New Mexico (later), and took a job sitting around on a mountain top scanning the world for vestiges of smoke. Not everyone is fire lookout material. Let’s just say you better be almost phobia free. I think the one that will get most people is Isolophobia. We are so interdependent on each other that most of us have a hard time flying solo. Give me a shelf full of the right kind of books and I can do without human interaction for a good long time. Longer yet if I can bring in a few baseballs games on the AM radio. The first time a hiker wandered up the trail I’d have to catch myself before I said something like “Greetings Human!”. Desolation Peak, Washington a place that Jack Kerouac spent 63 days scanning the skies for smoke while creating a lot of smoke himself. Connors talks about the connections with writers he likes and their time spent as fire lookouts. To a writer it seems like ideal conditions to expand the mind, focus the mind, and write the Great American Novel. Jack Kerouac discovered that he was willing to hike miles to pick up the makings for cigarettes during his 63 days on Desolation Peak. Connors discovered that Kerouac kept a diary during that time in shirt pocket sized notebooks. They were housed with his papers in the New York Public Library. Connors, with a number 2 pencil spent three days feverishly (Keetenesque) copying those diaries. They would prove to be a solace to him many times while pulling a long shift high above the treeline with nothing but sky between him and the next world. 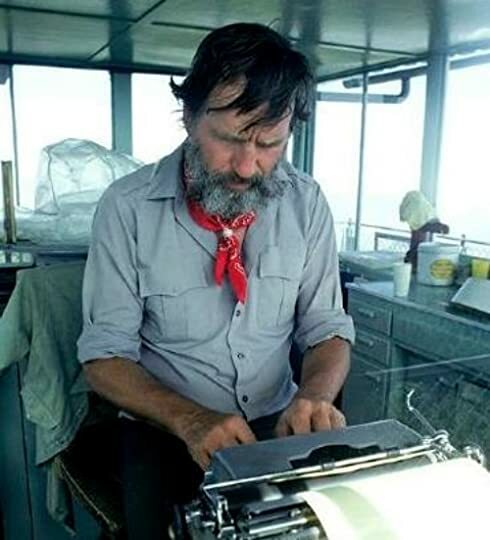 Edward Abbey in the glass cage checking for smoke and pounding away on his typewriter. There was also, famously, Edward Abbey who was teaching at the University of Arizona while I was in attendance there. He wrote two books: Black Sun and The Journey Home about his time in the Forest Service as well as at least one short story. It proved to be productive time for him sitting, watching, and thinking. There was the professor Norman MacLean. 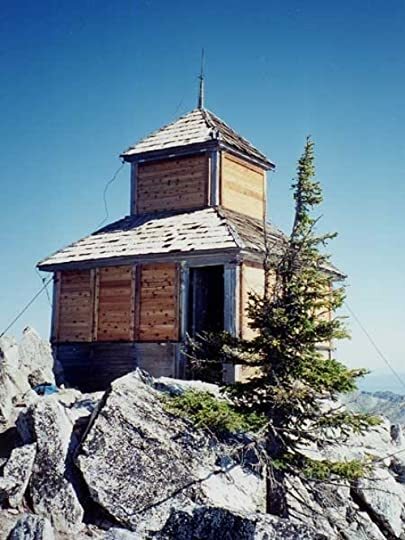 The Norman MacLean fire lookout tower at Grave Peak, Idaho. 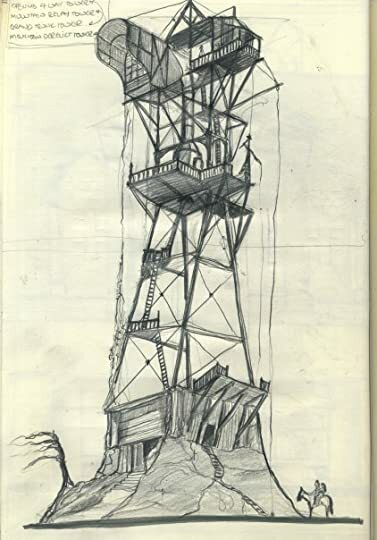 Don’t forget Gary Snyder and the poet Philip Whalen also spent time on lookout towers. One of the benefits besides solitude, and having a million dollar view is the plethora of wildlife that is teaming right beneath Connors’s nose. As you can probably tell this book produced a lot of fond memories for me, bringing a lot of my past forward into the future. Connors even mentions Dave Foreman, the progressive leader of Earth First!. When the FBI busted in his door, arresting him, and many others in his circle I was one of those people trying to decide how many rings of separation I was from having my own chat with the FBI. Connors talks about the devastation of Four-Legged Locusts overgrazing government lands and the negative effects of Aldo Leopold himself leading the charge to eradicate the wolf from New Mexico and Arizona to satisfying the fears of cattleman so proud of their historical heritage; and yet, so craven at the sound of a wolf howl. He gives us an overview of Victorio and his fight to remain free, using the Mexico border effectively, to prolong his ability to continue to be a thorn in the plans of the federal government. Victorio, an Apache chief intent on not giving in. Five stars because I enjoyed reading the book, but for everything else, content, prose, direction, it's closer to a three-star. The book is absolutely ideal to listen to as an audio book because nothing much happens and so if you drift away, you won't miss anything. It is a bit like a day dream, you come back to reality with a pleasant, peaceful feeling and don't even give a thought to what was going on meantime. I probably wouldn't be so hard on this book in the review if I hadn't just finished Five stars because I enjoyed reading the book, but for everything else, content, prose, direction, it's closer to a three-star. The book is absolutely ideal to listen to as an audio book because nothing much happens and so if you drift away, you won't miss anything. It is a bit like a day dream, you come back to reality with a pleasant, peaceful feeling and don't even give a thought to what was going on meantime. I probably wouldn't be so hard on this book in the review if I hadn't just finished Bernd Heinrich's One Man's Owl. Heinrich is an absolute master of writing about not a lot happening in the woods, in this case, observations of a semi-wild owl,a couple of crows and a log cabin. His books have a depth I would have enjoyed but didn't find in Fire Season. When I bought this book, I was excited to read it and hoping for insight into solitude and a different way of life. What I got instead was a steaming pile of self-absorption. Connors seems to fancy himself another Kerouac, going off into the wilderness to drink alone, be manly, and have profound experiences—none of which came through in his writing. There was a lot of hero-worship going on in the book, and I get the impression that Connors wants to see himself added to the list of great wilderne When I bought this book, I was excited to read it and hoping for insight into solitude and a different way of life. What I got instead was a steaming pile of self-absorption. Connors seems to fancy himself another Kerouac, going off into the wilderness to drink alone, be manly, and have profound experiences—none of which came through in his writing. There was a lot of hero-worship going on in the book, and I get the impression that Connors wants to see himself added to the list of great wilderness writers. Unfortunately, Connors's love for solitude is hard to appreciate vicariously, because he focuses too much on how awesome he is. After reading the book, I know how well HE knows the mountains, and how cool it is that HE goes hiking and fishing, and how annoying it is that he has to scrounge for tips as a barkeep for nine months of the year, and how lame people in the regular world are with their less-romantic day-to-day lives. But there was no room for me as a reader to feel that I could connect to his experiences through him. Obviously, all memoirs and travelogues have to focus on the author, because he or she is the one doing cool stuff and writing about it. But an author is at his best when he makes other people feel connected to what he's writing. Connors's wife's description of his activities as "little boy games" wasn't that far off, if we're being honest. I get the impression that he wanted me to read the book, then send him a scout badge and a pat on the back. The book's various forays into the history of government attempts to preserve/control/use the environment were interesting at times, but tended to go on so long that I found myself asking whether it was over yet. In 2002 Philip Connors quit his job as a copy editor at The Wall Street Journal to head to a lookout tower in the Gila Wilderness of New Mexico. His home for the summer was a small cabin, and a lookout tower topped by a 7'x 7' glass room. His job was to call in weather conditions and to scan the mountains for signs of fire. After his day in the tower was done, Connors would take his dog Alice for a long walk before cooking dinner. 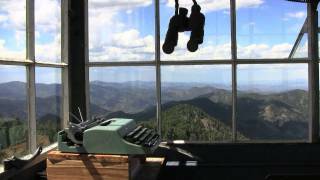 He often went for weeks without seeing another human, but had ple In 2002 Philip Connors quit his job as a copy editor at The Wall Street Journal to head to a lookout tower in the Gila Wilderness of New Mexico. His home for the summer was a small cabin, and a lookout tower topped by a 7'x 7' glass room. His job was to call in weather conditions and to scan the mountains for signs of fire. After his day in the tower was done, Connors would take his dog Alice for a long walk before cooking dinner. He often went for weeks without seeing another human, but had plenty of wildlife to keep him company. Connors writes, "If there's a better job anywhere on the planet, I'd like to know what it is." The author also also writes about the history of the Gila Wilderness. 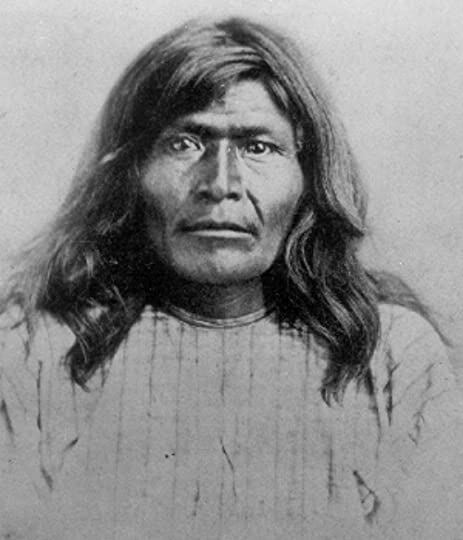 One of the most unfortunate events in Gila history is when the Apaches, led by Victorio, were slaughtered around 1979-1880. He refers back to other writers who worked as lookouts, naturalists, or foresters such as Jack Kerouac, Norman Maclean, Edward Abbey, Gary Snyder, Aldo Leopold, John Muir, Gifford Pinchot, and more. He discusses firefighting, including whether the Forest Service should allow forest fires to burn or extinguish them. There is also controversy about the gray wolf, and about cattle grazing on public lands. A meditation on nature and solitude fit to rival Sara Maitland’s A Book of Silence, Annie Dillard’s Pilgrim at Tinker Creek, and, I imagine (I hate having to sheepishly admit I still haven’t read such a classic), Thoreau’s Walden. “That thing some people call boredom, in the correct if elusive dosage, can be a form of inoculation against itself. Once you struggle through that swamp of monotony where time bogs down in excruciating ticks from your wristwatch, it becomes possible to break through to A meditation on nature and solitude fit to rival Sara Maitland’s A Book of Silence, Annie Dillard’s Pilgrim at Tinker Creek, and, I imagine (I hate having to sheepishly admit I still haven’t read such a classic), Thoreau’s Walden. A beautifully written memoir of Connors time in the American wilderness as a lookout for fires. It is tinged with melancholy, because of the tragedy of his brothers suicide, but this is the place that he feels most alive in. He writes of the wildlife that he sees, the majesty of the views and the terror and power of the amazing electrical storms. He has a way of writing that makes you feel like you are breathing the same air, looking from the same tower, watching the same wildlife. Philip Connors left a job at the Wall Street Journal ten years ago to work atop a fire lookout tower in the remote Gila National Forest in western New Mexico. He never looked back. Working in the tower for five months out of the year, scanning the horizon for the first smolder of a fire, and hiking, camping, eating, drinking alone for the most part, is Connors' perfect job. This book is Connors' story of his day-to-day life during a season in the wilderness lookout. The fire tower lookout (aka "the freaks on the peaks", as they are called by the Forest Service) is a dying breed and Philip Connors gives us a tantalizing glimpse into that isolated existence - which only last 3-4 months, but can feel like a year of misery depending on the hardiness of the person. This is a life that he embraces, considering he has done it for 8 seasons, and his descriptions of the joy of solitude, the contentment of watching and listening to the mountains, experiencing all the The fire tower lookout (aka "the freaks on the peaks", as they are called by the Forest Service) is a dying breed and Philip Connors gives us a tantalizing glimpse into that isolated existence - which only last 3-4 months, but can feel like a year of misery depending on the hardiness of the person. This is a life that he embraces, considering he has done it for 8 seasons, and his descriptions of the joy of solitude, the contentment of watching and listening to the mountains, experiencing all the nature around him with all of his senses was very vivid. 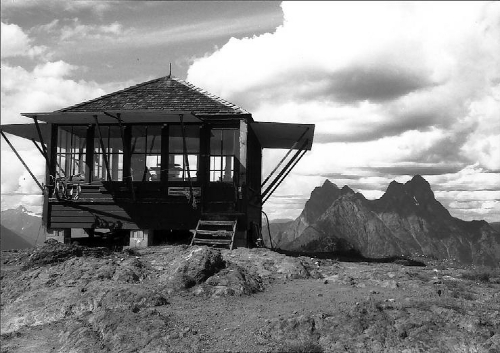 I've read some reviews where people took issue with his "tone" - condescension of those who quickly realize that a fire lookout life is not for them, that they crave the social atmosphere and fear being alone and in the dark. I can see some of that tone, but he also points out his own weaknesses, when he's craving a return to civilization for even just a couple days after a 10-day stint on a mountaintop in one of the most remote parts of the Gila with only the occasional hiker passing through for social contact. This book wasn't all about him, however. I really enjoyed the tangents he took into the history of the failed fire policy of the Forest Service and how nearly a century's worth of suppressing every fire is now the culprit for the explosive conflagrations that we're seeing all over the West. I previously had only the briefest understanding of it, but it's a topic that I will be reading up on and exploring more. He also takes many opportunities to opine about the current range policy (a prisoner to "tradition") and how cattle and ranching has also led to the disintegrated state of the ecology of the West which doesn't help the land deal with wildfires like they would have in a more untouched and undeveloped condition. If you're on the side of the ranchers, or think that the New Mexican wolf should be eradicated because they do what predators do and attack cattle, then I can see how this book would come across as excessively preachy. But to me he was singing to the choir so it didn't bother me at all. I'm knocking this down a star because I thought the tangent to 9/11 was unnecessary. He brought it in when talking about the closest he's been to fire and smoke, but what does the incinerated dust of collapsed skyscrapers have in common with the crown fires of ponderosa pine? I'm tired of every book written by someone who happened to be in NYC that day having it shoehorned into the narrative. It comes across to me as an obvious emotional ploy, and it falls short every single time. But overall, I thoroughly enjoyed it and thought there was a pleasant balance between the history of the Forest Service, Aldo Leopold's transformation from Forest Service utilitarianism to wilderness advocate, fire policy, previous famous fire lookouts like Kerouac, Victorio's raids, and his own personal story of self-enforced solitude in what has to be one of the most beautiful places on Earth, the Gila of southern New Mexico. I give this a happy 3.75 stars...it was not a perfect book, but a radical change of topic. As I read it, I realized that I was a strange, bookish teenager, and am weirdly well-schooled in the world of fire-watching from reading Kerouac et al. on the topic. Connors is no Kerouac, and, to his credit, he doesn’t try to be Kerouac. At times he got a bit didactic, but it could be that some of the science/naturalist topics were a lot to take in. He even threw in some Forest Service humor. He had a fai I give this a happy 3.75 stars...it was not a perfect book, but a radical change of topic. Connors is no Kerouac, and, to his credit, he doesn’t try to be Kerouac. At times he got a bit didactic, but it could be that some of the science/naturalist topics were a lot to take in. He even threw in some Forest Service humor. He had a fairly good balance between the factual info, the nature lover passages, and how he navigated between the isolation of fire-watching and ‘real life.’ There is a back story about how and why he became a fire-watcher, but it’s not in this book. I don’t want to know when the last of the fire-watch jobs were filled by drones. I actually live within driving distance of Desolation Peak, where Kerouac spent a couple of months. I see that the trail is rated “difficult,” so... armchair travels for me. This was super fascinating. I really truly for-reals want to live in a wilderness lookout for a summer or two. I loved the references to several books/authors/people that I have read over the course of my life and many of which I still need to read. Great read. Does have a few mature topics. In the spring and summer of 2011 the mountains and prairies of the southwest United States burst into flame. Some fires were started by lightning, others were man-made. No matter what started the fires the end result was that large swaths of land became charred wilderness. While fires that started in populated areas were easily spotted the fires in more remote areas were harder to see and therefore to control. The forest service’s first line of defense in these remote areas are the fire lookouts In the spring and summer of 2011 the mountains and prairies of the southwest United States burst into flame. Some fires were started by lightning, others were man-made. No matter what started the fires the end result was that large swaths of land became charred wilderness. While fires that started in populated areas were easily spotted the fires in more remote areas were harder to see and therefore to control. The forest service’s first line of defense in these remote areas are the fire lookouts – men and women sitting high up in towers scanning the horizon for telltale smoke and calling it in to the firefighters. 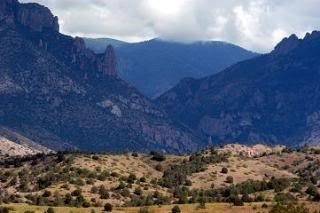 Author Philip Connors gives us a look into this unique job through his personal experiences working as a fire lookout in the Gila National Forest in New Mexico. Each chapter is a month of his summer and each begins with a quote about fire lookouts or our national forests to give us an understanding on how others saw them. The chapters are filled with his fire lookout job plus he includes some of his experiences and wanderings in the mountains with his dog Alice and the few moments he gets to spend with his wife Martha (who stays in town). But since there can only be so much written about his life as a lookout (most of the time it is just staring out over the mountains) he includes information on other famous fire lookouts and foresters of the past, including Aldo Leopold (who wrote A Sand County Almanac), beat novelist Jack Kerouac, and Norman Maclean (who wrote A River Runs Through It which was made into a well received movie and the fire fighters book Young Men and Fire). But it is more than a monthly activity journal as the author ruminates about history of fighting forest fires. As he pointed out, he hoped that the book “will offer another view of fire and its place in nature, a view too little glimpsed on our television screens.” Throughout the book he slips in quite a bit of information, almost too much, of the history of fighting forest fires in our nation. While giving us both points of view (whether to fight a fire or not) at times he is so thorough that I feel he could have gotten his point across with a little less “padding”. Philip Connors has written a curious memoir about his years (eight at the time of this writing) 10,000 ft above sea level in New Mexico’s Gila National Forest from spring until fall, watching for fire. He claims successful fire spotters have “an indolent and melancholy nature,” and he should know. He spends long days gazing over the ridges, spotting smoke which heralds a cleansing clearing of dead brush, or a devastating hurricane of wind, smoke, and fire that eats all things manmade and natural in its path. There are only a handful of fire spotters left in our western states, paid $13/hour for the dry summer months, but Connors is one of them. He relishes his 10 days on, 4 days off sojourn from April to August, catching up on reading, thinking, writing, while he casts an eye out from a 55-foot tower high above Apache Peak. He admits to a "perverse and loathsome envy" for those lookouts whose peaks are higher and more remote, and whose stories are better than his. He tells of famous forest fires and naturalists that changed U.S. Forest Service policy, first one way, and then another. He reminds us of Norman Maclean’s classic Young Men and Fire detailing the 1949 Mann Gulch Fire in Montana in which twelve smokejumpers were killed or fatally burned as the result of a poorly-understood “blowup.” He researches the jottings and writings of Jack Kerouac, fellow fire-spotter from years before, and muses on his own solitary path and the love of a woman willing to grant him the freedom to be on his own. I thought this as I listened to Sean Runnette read the Blackstone Audio edition of this book. But I came to challenge my position at the end. In the fire off-season, the author is a copywriter for The Wall Street Journal. A jarring note is struck at the end of the book, when the author tells us of his experience on 9/11, at the time of the Twin Towers’ fall. Here a man, who watches for fires in the natural world, finds himself in an inferno most unnatural. It is a weird, dislocating juxtaposition, just as a plane striking the World Trade Center in New York was for people around the world. But it leaves us unsettled again, just as we were at the time, for it brings home the arbitrariness of one’s location in the big scheme of things, and makes us think that watching for fires is not so indulgent after all. This summer I decided to tackle a bunch of fire-related books I've been meaning to get to. I figured that with the AC pumping and typhoons doing their best to aim at the island I call home they would be less threatening, and they sorta were. Next up - Fire Season. The book covers one year of lookout duty by Connors, starting with a five mile hike up the mountain with his dog, Alice. His food and other supplies will be brought in by mule. The wet spring quickly turns dry and he spends his time rea This summer I decided to tackle a bunch of fire-related books I've been meaning to get to. I figured that with the AC pumping and typhoons doing their best to aim at the island I call home they would be less threatening, and they sorta were. Next up - Fire Season. Sometimes I liked these diversions better than the main narrative. Connors talks about his mountain, his tower, his experience. I would have liked him to take a step back and muse about, say, the human need for solitude instead of just his need for solitude. Other lookouts are name checked but I'd like to know more about them and how their experience differs. Is the female lookout as eager to invite hikers up to her tiny tower? Connors makes it sound like you need to be like him in order to do this job when obviously that is not the case. "...the skills required of a person here, aside from the use of the Osborne Firefinder, are more intuitive than mechanical and therefore difficult to impart. It's one of those jobs you can learn only by doing." Despite this we don't get to see him mess up or learn much of anything. The book covers his eighth season - he has all the mountain and valley names memorized, he knows exactly when he can get away with taking a nap, he clears rat nests out of his cabin without even wrinkling his nose because hey, he's done it for the better part of a decade. Connors meets bad circumstances but they're acts of nature, not due to a misstep or bad planning on his part. The whole thing comes off as macho and annoyed me more as the book went on. 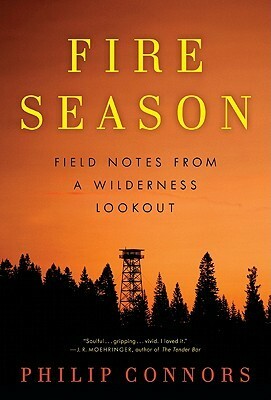 "Fire Season: Field Notes From a Wilderness Lookout"
by Philip Connors is one of those relaxing airplane ride books or winter fireside reads that really lets you understand how being on a fire watchtower, miles from anyone else could be both exciting and soul refreshing. Solitude is something that many of us don’t get enough of anymore. At the same time, when the storms come in and Zeus starts throwing his bolts of fire and Thor hammers you from all sides, the Gods of old seem more than real, in fact, they are right there in the room with you and you cringe at their very power and being! My buddy, Scott Fitch, who spent a number of summers on mountain tops with his hair electrified vouches for the truth of Conners’ words. Out in the Gila National Forest in a hundred square feet of fire tower there’s plenty of time to think and even go buck stark naked if you so choose as long as you keep the eyes peeled for those tiny whisps of smoke that are the telltale signature of Mother Nature about to break loose and go on the rampage at Apache Peak. blurb - Capturing the wonder and grandeur of this most unusual job and place, Fire Season evokes both the eerie pleasure of solitude and the majesty, might and beauty of untamed fire at its wildest. Connors' time on the peak is filled with drama - there are fires large and small; spectacular midnight lightning storms and silent mornings awakening above the clouds; surprise encounters with smokejumpers and black bears. Filled with Connors' heartfelt reflections on our place in the wild, Fire Season is an instant modern classic: a remarkable memoir that is at once a homage to the beauty of nature, the blessings of solitude, and the freedom of the independent spirit. Produced by Jane Marshall A Jane Marshall Production for BBC Radio 4. Yours truly is the flame retardant material flung on the fires of all those glowing reviews. Sorry folks, this left me cold; maybe I should pen Field Notes from an Elk Wilderness Lookout and add a trivia question about the name of my dog. Fire Season. There's a lot for me to say about this book. As an agriculture technology student that plans to go into Forestry. Living in Texas, close to where this book takes place. I guess it simply just struck a, common ground with me. A ground very intimate and close to my heart. As a lover of nature and the wild this book has kickstarted me on a habit for wanting to delve deeper into the literary minds of lookouts and nature loving individuals and stories in general. This book, while it may s Fire Season. There's a lot for me to say about this book. This book, while it may seem simple, like it has only just scratched the top of what could be an incredible story of insight and solitude has really created a jumping off point for me to go forward and venture into different books that relate to lookouts and the very nature we surround ourselves in. It's a short book, one that many may find shallow or otherwise boring and not having enough depth. But for anyone that is a lover of nature and the wild, and has an interest in wanting to connect their-self more with nature and the mindset needed for it I can't help but recommend this book again and again. This book has struck me in the heart, and has set me onto a course to become more connected with nature, more connected with that in which we have been so quick to forget and to purposely advance technologies in an effort to distance ourselves from. I have mixed feelings about this book. Philip Connors has some serious writing skills but it seems like he lacks the discipline and drive to really polish and create literary beauty. He is honest, though, about his tendency towards laziness - I'll give him that. This book does not contain a lot of fire thrills as you might assume from the cover. Connors does give you a pretty good picture of what it's like to spend days on end in the solitariness of a wilderness lookout, a potentially boring or I have mixed feelings about this book. Philip Connors has some serious writing skills but it seems like he lacks the discipline and drive to really polish and create literary beauty. He is honest, though, about his tendency towards laziness - I'll give him that. This book does not contain a lot of fire thrills as you might assume from the cover. Connors does give you a pretty good picture of what it's like to spend days on end in the solitariness of a wilderness lookout, a potentially boring or exciting experience, depending on how you look at it. The discussion of fire management and how it has changed over the years was quite interesting as well as the history of the area. While the beginning of this book started out somewhat strong, the ending really fizzled into filler drivel. Connors has some potential, but not sure that I'd read anything else of his. Loved this book! Glad I bought it. Romanticism meets pragmatism. Should become another classic about the West. Besides being an introspective book it's also a primer on the natural world and the American West. We meet Jack Kerouac, Norman Maclean, Aldo Leopold, and the ghosts of the Apache and Buffalo Soldiers. Great prose, vivid descriptions, and lines/aphorisms that will linger with me. Now I have to visit Silver City, NM. A beautifully written book that combines descriptions of wild fires with the history of the Forest Service; living in solitude for a third of the year with pointed criticism of the joke that is farm/ranch subsidies; and a thousand little observations that tie everything together into a lovely poem of a book. Recommended. In my humble opinion, this is a book that is best enjoyed by reading slowly. It became a ten day read for me, due to exams and other business that meant I didn't have much time - but in the end I'm glad it got slowed down, and would recommend that you do it on purpose if you read it. It almost created the feeling that you got to go back into the wild every time you picked it up again, back to the tower and the cabin and the meadow. And reading it in only a couple of days would not give you enoug In my humble opinion, this is a book that is best enjoyed by reading slowly. It became a ten day read for me, due to exams and other business that meant I didn't have much time - but in the end I'm glad it got slowed down, and would recommend that you do it on purpose if you read it. It almost created the feeling that you got to go back into the wild every time you picked it up again, back to the tower and the cabin and the meadow. And reading it in only a couple of days would not give you enough time to create that feeling - I think. But of course, we never experience a book similarly. "Days pass in which there is nothing but wind, bending the pines to postures of worship of an unseen god in the east." Some area descriptions, especially in the beginning, were a bit confusing to me, but only because I have zero knowledge of geography in that area. A bunch of mountain ranges that didn't ring a bell with me made it difficult to picture what he described. But knowing exactly where he is and what mountain he is talking about is hardly the point. Somewhere in the back of my mind, I did know that fires sometimes serve a purpose in nature. But for some reason I hadn't made a connection between that and wildfires in lookout areas. I expected this book to be about saving the forest from fire, and then about a whole lot of nature in between the fires. Within the first ten pages, however, I was made aware of my ignorance. Fire is good - fire is necessary. For all kinds of reasons which Connors explain in full, in both educating and entertaining ways. And the history of America's relationship with fire and wilderness (not always a happy story) is nicely interspersed with personal anecdotes, and is tied to the narrative of a full summer season on the peak, the book divided into April, May, June, July, and August. This structure works really well. I must admit, a possible reason I enjoyed it so much was because I read it after The Moth Snowstorm, which left me with a feeling that I hadn't quite gotten what I wanted from it. This book gave me that. And there is a common theme of wilderness and the consequences of man-made progress in both, which meant that I had some understanding and background knowledge going into this one, making it easier to sit back and enjoy learning more. A few things felt tedious or misplaced, but very few indeed, and not necessarily ones others would agree with. And it has definitely become a nature-writing favourite for me, nonetheless. At times there is excellent in prose, like in all rambling, there is a lot of chaff to be sorted through. He gives good background to how we got wilderness areas as well as prescribed burns-enough that you want to dig in. As someone who is a volunteer fire lookout, I found that his story was one which I was interested and he did not disappoint. I am not sure about someone who does not have experience in a lookout, who well this would resonate. For more of my thoughts on this book, please see my book blog. I read this with a lot of interest, because sitting in a fire tower for a summer is something I have always wanted to do. There were a lot of nice quotations from nature writers, and poets in general. You get a great feeling for what it's like to overlook the Gila Wilderness in a number of different conditions. I wondered why he chose this summer and not one more fire-ridden, since he had a number of seasons to choose from. Overall the tale was rather repetitive--the view was described multiple I read this with a lot of interest, because sitting in a fire tower for a summer is something I have always wanted to do. There were a lot of nice quotations from nature writers, and poets in general. You get a great feeling for what it's like to overlook the Gila Wilderness in a number of different conditions. I wondered why he chose this summer and not one more fire-ridden, since he had a number of seasons to choose from. Definitely an interesting concept and experience for this guy, but the material was lacking. Not enough action.